Rachael Dowling – BA; MA (Hons) Made her screen debut as Lily in John Huston’s classic film adaptation of Joyce’s The Dead. In 2016 will be seen as Sister Sarah in Jim Sheridan’s latest feature The Secret Scripture. She also appeared in Sheridan’s, The Field, In The Name Of The Father, as well as several of Sheridan’s theatre productions in NYC’s Irish Arts Centre. Other films include The Tichborne Claimant opposite Robert Pugh & Stephen Fry. Bogwoman opposite Peter Mullan. Rewind. Widow’s Peak. Theatre work includes: The Unmanageable Sisters – Abbey Theatre. Richard II- The Abbey Theatre (Peacock Stage); Michael Barker-Caven Dir. The Country Girls; Gaeity Theatre/Red Kettle Prod. Mikel Murfi, Dir. Green Street; Dublin Fringe Festival; Percolate Theatre Company. Paul Meade, Dir. Measure for Measure; Then This Theatre; At Project. Aoife Spillaine-Hinks, Dir. 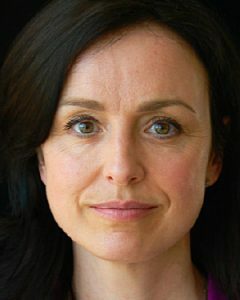 Rachael wrote and directed award winning short film Stealth and she directs for the theatre including Missing Football: award winning first play by Irish Screen Writer Peter McKenna (Red Rock; The Clinic; Eastenders; Holby City). The Tichborne Claimant (Feature) Mary Anne David Yates Bigger Picture Co.
September (Tv Movie) Katy Colin Bucksey German+ Irish Co-Prod. Green Street Lady Elizabeth Wolfe Paul Meade Percolate Theatre Co.
Richard 11 Dutchess Of York Michael Barker-Caven Peacock/Everyman Th. MA (hons) – Dublin City University.